Durante was born in Brooklyn, New York, the third of four children born to Italian-Americans Bartolomeo Durante (1849–1942) and Rosa (Lentino) Durante (1858–1921). He served as an altar boy at New York City's Saint Malachy's Roman Catholic Church also known as the Actor's Chapel. Durante dropped out of school in the eighth grade to become a full-time ragtime pianist. He first played with his cousin, whose name was also "Jimmy Durante." It was a family act, but he was too professional for his cousin. He continued working the city's piano bar circuit and earned the nickname "Ragtime Jimmy," before he joined one of the first recognizable jazz bands in New York, the Original New Orleans Jazz Band. Durante was the only member not from New Orleans. His routine of breaking into a song to deliver a joke, with band or orchestra chord punctuation after each line, became a Durante trademark. In 1920, the group was renamed Jimmy Durante's Jazz Band. Durante became a vaudeville star and radio personality by the mid-1920s, with a trio called Clayton, Jackson and Durante. Lou Clayton and Eddie Jackson, Durante's closest friends, often reunited professionally. Jackson and Durante appeared in the Cole Porter musical The New Yorkers, which opened on Broadway on December 8, 1930. By 1934, he had a major record hit with his own novelty composition, Inka Dinka Doo. It became his theme song for the rest of his life. A year later, Durante starred on Broadway in the Billy Rose stage musical Jumbo, in which a police officer stopped him while leading a live elephant and asked him, "What are you doing with that elephant?" Durante's reply, "What elephant? ", was a regular show-stopper. Durante also appeared on Broadway in Show Girl (1929), Strike Me Pink (1934), and Red, Hot and Blue (1936). He began appearing in motion pictures in a comedy series pairing him with silent film legend Buster Keaton and continuing with The Wet Parade (1932), Broadway to Hollywood (1933), The Man Who Came to Dinner (1942, playing "Banjo", a character based on Harpo Marx), Ziegfeld Follies (1946), Billy Rose's Jumbo (1962, based on the 1935 musical), and It's a Mad, Mad, Mad, Mad World (1963). On September 10, 1933 Durante appeared on Eddie Cantor's The Chase and Sanborn Hour, continuing until November 12 of that year. 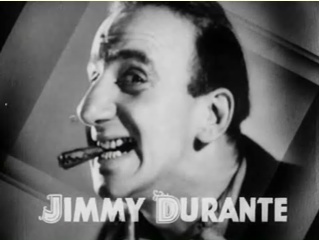 When Cantor departed, Durante took over the NBC show as its star from April 22 to September 30, 1934, moving on to The Jumbo Fire Chief Program (1935–36). He teamed with Garry Moore for The Durante-Moore Show in 1943. Durante's comic chemistry with the young, brushcut Moore brought Durante an even larger audience. "Dat's my boy dat said dat!" became an instant catchphrase. The duo became one of the nation's favorites for the rest of the decade, including a well-reviewed Armed Forces Radio Network command performance with Frank Sinatra that remains a favorite of radio collectors today. Moore left in mid-1947, and the program returned October 1, 1947 as The Jimmy Durante Show. Durante worked in radio for three years after Moore's 1947 departure, including a reunion of Clayton, Jackson and Durante on his April 21, 1948 broadcast. Durante made his television debut on November 1, 1950, though he kept a presence in radio as one of the frequent guests on Tallulah Bankhead's two-year, NBC comedy-variety show, The Big Show. Durante was one of the cast on the show's premiere November 5, 1950. The rest of the cast included humorist Fred Allen, singers Mindy Carson and Frankie Laine, stage musical performer Ethel Merman, actors Jose Ferrer and Paul Lukas, and comic-singer Danny Thomas (about to become a major television star in his own right). A highlight of the show was Durante and Thomas, whose own nose rivaled Durante's, in a routine in which Durante accused Thomas of stealing his nose. "Stay outta dis, No-Nose!" Durante barked at Bankhead to a big laugh. From 1950-51, Durante was one of four alternating hosts on NBC's comedy-variety series, "4 Star Revue." He alternated Wednesdays with Danny Thomas (now a headliner), Jack Carson, and Ed Wynn. On August 4, 1955, The Jimmy Durante Show was the venue of the last performance by the famous Brazilian singer Carmen Miranda. Miranda fell to her knees while dancing with Durante, who instinctively told the band to "stop da music!". He helped Miranda up to her feet as she laughed "I'm all out of breath!". "Dat's OK, honey, I'll take yer lines" Durante replied. Miranda laughed again and quickly pulled herself together, finishing the show. However, the next morning, August 5, Carmen died at home from heart failure.